In 2015, the first medical marijuana dispensary opened in Massachusetts. This was nearly eight years after voters first approved the decriminalization of small amounts of marijuana in 2008. But stoners, rejoice: Massachusetts legalized the use of marijuana in 2016, and in 2018, recreational marijuana dispensaries entered the game as well. 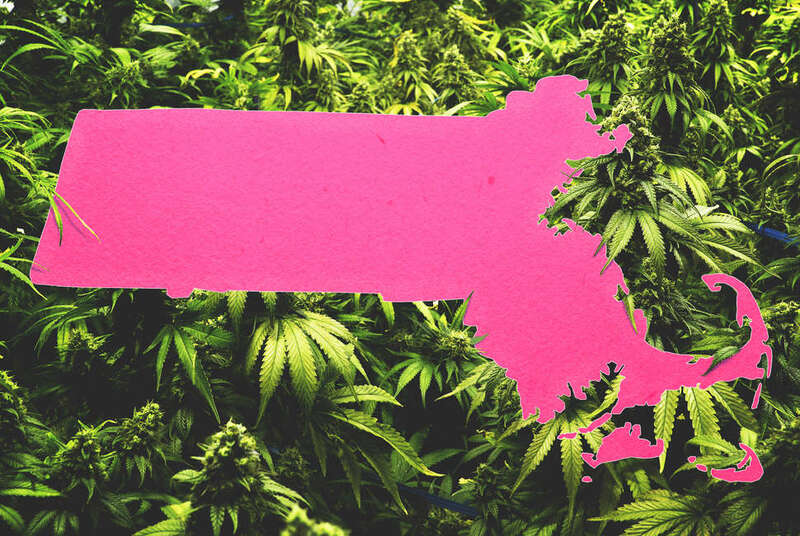 With several recreational weed shops opening their doors since it was legalized, Massachusetts is well on its way to becoming the Colorado of the East Coast, with locals enjoying the high spirits and visitors flooding in from other states to get some goods. Even so, the laws surrounding legalization are slightly confusing, and it can be hard to understand exactly what is and still isn’t legal even with a solid number of medical and recreational dispensaries bubbling up all around. There are many questions as to how medical marijuana works in Massachusetts, like: How do I even find a doctor to prescribe it to me? Can I blaze up during a late-night trip to Wendy’s or a pit stop to Sullivan’s Castle Island? There are even more questions about how recreational toking works now that it’s been legalized. To help us figure it out, we spoke to experts with intimate knowledge of all things cannabis in MA. Here's all the need-to-know facts if you want to smoke up, whether it’s medicinal or for a little fun. So is recreational weed legal? When and where can I buy it? Recreational marijuana use was legalized in 2016 for anyone over the age of 21, and medical marijuana is still fine for anyone who gets a prescription and goes through the registration process. As for the amount that you can possess, the law says you can have up to 1 oz on you and up to 10 oz in your home, which you can get at dispensaries. No. Even though it’s been legalized, it’s still illegal to consume medical or recreational weed in public. That means no smoking on sidewalks, in restaurants, at parks, schools, or on public transportation. Basically, your safest bet is smoking inside with friends and avoiding any public places, especially if you’re carrying medical marijuana but don’t have your paperwork on you just in case. The legalization of marijuana essentially means that it’s sort of OK to have but doesn’t necessarily mean you can get your fix anywhere and everywhere. Discretion is your friend. Also keep in mind that, though weed is legal in Massachusetts, it’s still not legal under federal law. That means if you’re caught with marijuana on federal lands, including parks or monuments, you can still be charged with a federal crime. So you probably want to keep your cannabis at home if you’re going to Cape Cod for the weekend. Better safe than sorry. So can I still be charged with illegal possession? This gets complicated, but the short answer is yes. Again, even though it’s technically legal, you still need to have the necessary paperwork that shows you qualify to use it for medical reasons. Without it, you’re still breaking the law. 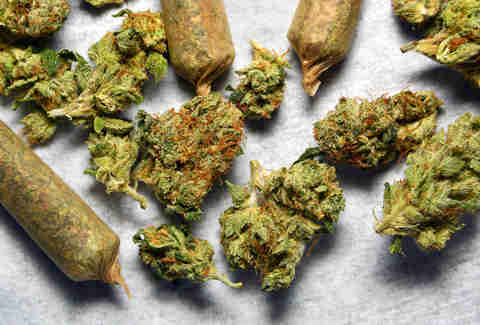 If you do qualify and are legally registered, though, you can possess up to 1 ounce of marijuana outside of your residence, or up to 10 ounces inside your residence. Having anything more than that, or getting caught without the proper paperwork for medical marijuana, still makes you liable to be charged, and fined or put in jail. It’s a similar predicament for recreational marijuana, which you can technically buy and smoke, but that doesn’t mean you can’t get in trouble with the law if you do it while out and about. Toke responsibly. What are the dispensary options near Boston? While there’s a fair amount of options around the city, there are unfortunately none in Boston proper. That said, who doesn’t love a mini roadtrip? Some of the best dispensaries near Boston are NETA Brookline and NETA Northampton, which was the state’s first recreational dispensary. Spots like these sell a wide variety of assortments and boast expansive menus, including edibles, gummies, and brownies, so you’re set no matter how you like to get your fix. If you’re looking for the quickest trip possible, you’ll want to check out NETA Brookline, which is only a few minutes outside of Boston by train. But if you don’t mind the drive, you might consider heading to Berkshire Roots in Pittsfield, the town that boasts two different recreational dispensaries, when most places in Massachusetts don’t even have one yet. As long as you’re a resident of Massachusetts, you can sign up for a medical marijuana card if you have a qualifying medical condition. First, you’ll have to discuss your current medical conditions and medical history with a doctor, and they’ll have to explain the risks and benefits of marijuana use to you. Then you’ll be required to get a physician certification -- a document signed by a doctor who believes medical marijuana will benefit you. That will cost about $200 and can be acquired from places like Canna Care or GreenWay Massachusetts. When signing up for an ID card, you’ll have to register with the Medical Use of Marijuana Program. The registration fee is about $50, unless you’re below the federal poverty level. You can find more information here. What are the approved conditions? To qualify for a physician certification, you’ll need to demonstrate you have one of the approved conditions that are considered debilitating and might be alleviated by medical grade marijuana. These can include but are not limited to: AIDS, ayotrophic lateral sclerosis (ALS), cancer, Crohn's disease, glaucoma, hepatitis C, HIV, multiple sclerosis (MS), Parkinson's, insomnia, or anxiety, among others. What kind of doctor do I have to go to? You must go to a doctor or certifying physician who you have an established and “bona fide physician-patient relationship” with. This is just to prevent doctors from giving out baseless medicinal marijuana certifications to everyone who walks through their doors. Basically, as long as you go to a doctor you trust who has some sense of your medical history and is likely to support your exploration of medical marijuana use, you should be fine. However, under the law, a bona fide physician-patient relationship specifically means you have to go to a doctor you’ve already had a complete clinical visit with in the past. According to Tim Keogh from Bask Cannabis, the scenario might not always be so straightforward, depending on who your doctor is and how they feel about legal weed. 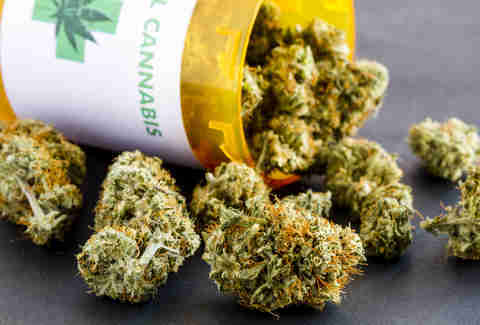 “Primary care physicians have to go through specific courses and get certified through the Department of Health,” Keogh told Thrillist, adding that some have chosen not to go through that process “because maybe they don’t feel comfortable with it and don’t want to prescribe marijuana unless it’s a last, last resort. Or they work for the VA and they’re not allowed to.” Because of that, there are clinics that have stepped in to fill that void for patients who can benefit. If you’re not able to work with a primary care physician, you can work with a clinic, and from there, it should take about three to seven days for you to get a temporary ID. How much medical marijuana can I buy at a dispensary? Thanks to this handy dispensary guide, you can find any and every legal marijuana dispensary in the state of Massachusetts, including ones in Boston. Currently, patients in Massachusetts who qualify to use medical marijuana are limited to a 60-day supply of up to 10 ounces with a prescription. If your doctor decides that it’s medically necessary to prescribe you more than 10 ounces for that 60-day period, you may be able to purchase more. Lucky you! Can I pay for it using my insurance? Unfortunately not. No insurance provider in Massachusetts currently covers medical marijuana use. Bummer. That means you’ll have to use cash or your card. Am I allowed to grow my own medical marijuana? That’s a yes! The medical marijuana laws currently allow both registered patients and caregivers to grow their own marijuana. But there’s a catch -- in order to grow marijuana legally, you’d have to provide proof that purchasing medical marijuana from a dispensary would result in "hardship." It can be a documented financial hardship, being physically unable to get to a dispensary, or not having a dispensary within reasonable distance from your home. You can also get a written recommendation from your doctor to grow marijuana if you qualify. Still, even if you qualify for the hardship exception, you or your caregiver are only allowed to grow a limited number of marijuana plants. You can only grow however many plants will give you a 60-day supply. As of 2016, any adult who qualifies may now grow up to six marijuana plants at a time, with a limit of 12 plants per residence. But of course there’s another catch. You also have to grow and store the marijuana in an enclosed, locked area that can’t be seen by and isn’t accessible to the public. On top of that, you can’t grow it at your home and also have a caregiver grow it at theirs. It’s one or the other. The legalization of marijuana essentially means that it's sort of OK to have but doesn't necessarily mean you can get your fix anywhere and everywhere. If I already have a medical marijuana recommendation from another state, can I use it to buy legal weed in Massachusetts? Nope. You have to be registered IN Massachusetts in order to legally purchase medical marijuana in the state. However, state laws include a clause that allows patients visiting Massachusetts from other states to possess their own medical marijuana while in Massachusetts. Can I take the weed that I buy in Massachusetts to another state? If you’re planning to stock up in Massachusetts and then take a road trip, beware. If you travel across state lines, it’s possible that you could be charged with a federal felony -- even if you’re legally registered as someone who qualifies to use medical marijuana in Massachusetts. Some states have reciprocity with others, which might honor another state’s medical marijuana prescriptions. Even so, taking marijuana across state lines is still illegal, and it would be smart to register with the state you’re visiting to purchase any marijuana you need from a dispensary in that state. What about transporting it within the state? Can I do that? You can only legally transport marijuana if you yourself are a registered medical marijuana patient, caregiver, or work for a registered marijuana dispensary. Otherwise, transporting marijuana (in any amount) is still illegal in Massachusetts. To be able to legally transport it, all you need is your medicinal marijuana ID card. Then -- and only then -- can you carry the legal amount that your doctor has prescribed you for your 60-day supply. That means you can carry up to 10 ounces of marijuana legally, unless your doctor has prescribed you more. If you’re not the one buying or transporting marijuana, but you’re a registered caregiver, you’re allowed to bring a patient to and from a dispensary or purchase it and take it to them. People who work at dispensaries are allowed to transport marijuana to other dispensaries and to caregivers or registered patients as well. What does the cannabis industry look like in Massachusetts now that both recreational and medical marijuana are legal? The Cannabis Control Commission (CCC), the five-member panel in charge of regulating Massachusetts’ marijuana industry, is the entity in charge of deciding which dispensaries get licenses, and what kinds of marijuana businesses can operate in the state. It’s been approving new shops on a rolling basis since weed was legalized. There are currently 15 dispensaries open in the state, but that number could easily double in the next few years. While some have speculated that Massachusetts may also become the first state to issue social use licenses, that remains to be seen. In addition to dispensaries, some restaurants and cafes boast weed-infused menu items. Someday, depending on how the laws pan out, there could even be movie theaters that sell pot brownies, or pot popcorn, but we're not there yet. There is, however, a new kind of “pot-leisure” economy that has also sprouted up since recreational weed was legalized, with businesses like weed-enhanced yoga classes and cannabis cafes and lounges making their mark on the New England map. There’s even a weed-infused fine dining experience, for those who want to feel truly high class -- if you know what we mean. Still, the ways people can legally consume the drug is limited, and the CCC has ongoing studies on ways to address concerns over impaired driving and underage access, among other issues. Nonetheless, Smith said, the CCC hasn’t totally slowed down the expansion of a green state. Legalization has so far proven lucrative in places like Northampton -- a town with less than 29,000 residents -- having seen over $700,000 in revenue from recreational marijuana sales since dispensaries opened up shop. Even so, Smith said, the legality of cannabis hasn’t erased ethical concerns surrounding the drug. She said the industry should take cues from initiatives like The Hood Incubator, and become more diverse “primarily by hiring more people of color and women of color, and not just in the retail and growing side but in management as well.” She also pointed out that while a fair number of dispensaries are owned by big companies, the weed business could create opportunities for locally owned shops. Massachusetts is growing more marijuana-friendly every day, with festivals like Extravaganja at large, and according to Smith, doctors are even becoming more easygoing about their views on the drug’s truly medicinal qualities. *Smith's name has been changed due to a non-disclosure agreement preventing her from speaking on the record about her job. Elly Belle is a writer for Teen Vogue, Thrillist, and more. Primarily, she's Brooklyn's resident pun enthusiast. Read more of her writing here. Follow her at @literElly.